Here's a sneak peek at tonight's watercolor class painting project. Dark and stormy sky with a colorful wet into wet fall tree line and a simple light, medium, dark varying foreground. 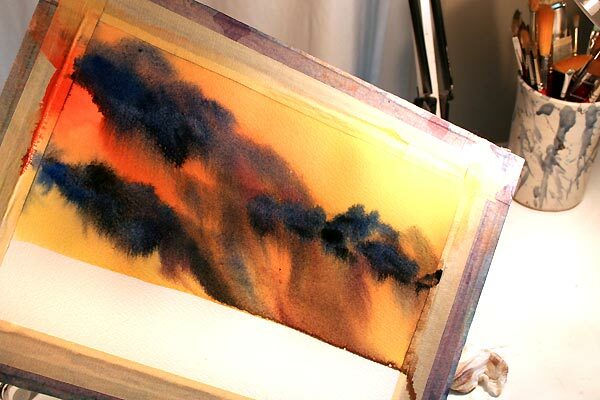 Tilting wet into wet watercolor can create drama and cool effects in your paintings. 1. Apply strong colors wet into wet. 2. 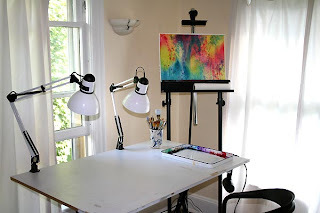 Tip your board at a steep angle, allowing the colors to flow and blend. For this one I tipped the board almost vertical and angled it resting the right bottom corner on my table. I used a paper towel to blot and paint & water that ran off the edge of the paper. 3. Once your are satisfied with the movement of the paint. Lay the painting flat to dry. 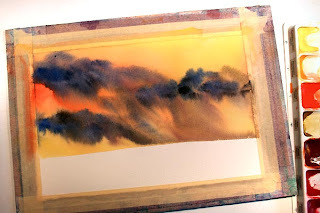 This is an excellent way to create a dramatic sky in your paintings. This is the finished product from Tuesday's Tips. I meant to post it first thing Wednesday morning and other stuff just got in the way. 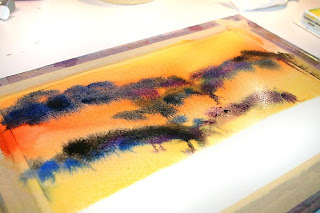 I loved the project so much, I used it as Wednesday's Watercolor Class project for the first night. Kind of a really hard test for my students (Sorry about that.) But in a way, it really does give me an idea of where people are at watercolor painting wise. It's not perfect, but it's great practice in painting without drawing first, value changes light to dark, painting a quick still life and painting negative space. 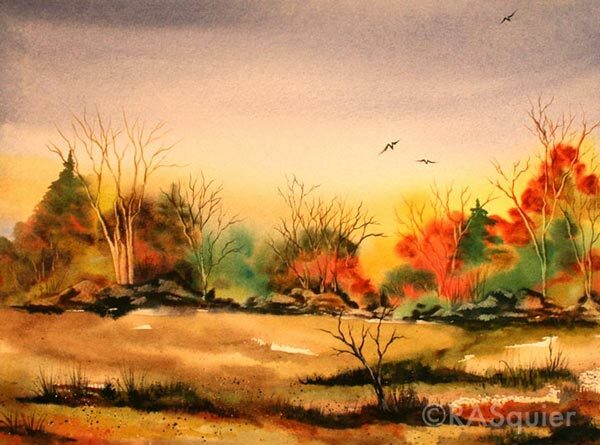 Step out of your comfort zone and paint what is right in front of you. Try a style of painting you want to improve upon or have never tried before. Challenge yourself. Today's a blustery rainy day here. I look out my window and I see maple leaves and small ornamental trees in the background. Inside, right in front of me a still life waiting to be painted. A simple roll of tape and a few watercolor paint brushes. I personally do not set up a lot of still lifes. But there it is, right in front of me. A painting style I would like to do more of is negative shape painting. I would normally give it a go with trees, leaves, flowers. Today, I am attempting a negative space painting with a still life of common objects from my studio and I will do it all with one color making it an exercise in value tones. I chose a blue with a wide range in values for the gloomy weather outside my window. 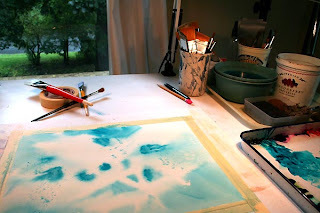 A quick shot of how my painting table looks right now at this very moment. By now the paint and water have dried back and the painting is ready for step 2. What style or technique can you challenge yourself with? The dough will come together and form a smooth ball. Bake at 350˚F for about 12 minutes or until edges are barely golden. If you want to flavor these cookies, you can add your favorite extract. They're good with or without extract. I've tried vanilla, lemon and almond at different times. About a 1/4 to 1/2 teaspoon. But it's really not necessary. Most of the time, I mix the dough together by hand. Literally by hand, no spoon. It forms a smooth ball, the sides of the bowl and your fingers will be clean when ready for the next step. I scoop out the dough and create little balls using a mini ice cream scooper thingie. You can do heaping teaspoons. Use your hands to form into little round balls. Place on an ungreased cookie sheet. Find something nifty to use to flatten them. 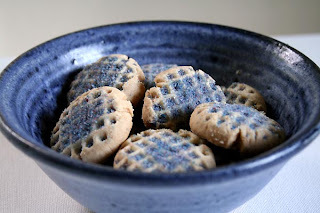 A glass, a cookie press gadget with a pretty pattern, a vintage meat tenderizer is what I chose for my periwinkle shortbreads shown below. Dip the flattening tool into flour occasionally and then press the cookies flat. Sprinkle with sugar. I took regular sugar and added a few drops of food coloring and stirred to make the sugar periwinkle in color. 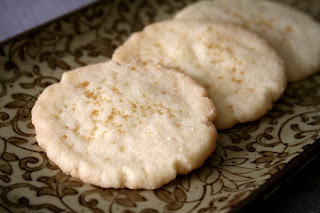 When my husband made a batch, he really flattened them and added raw sugar and flattened them again. We've been making them like that since! Makes you think you're getting a bigger cookie even though it's the same amount of dough since we use the scooper. Plus the raw sugar is a pretty amber color and saves one step of coloring the sugar. Depending on how thin or thick your cookies are the baking time will differ. The thinner the cookie, the shorter the time. The thinner the cookie, the crispier they are. If you like the more crumbly shortbreads, don't flatten them too much. 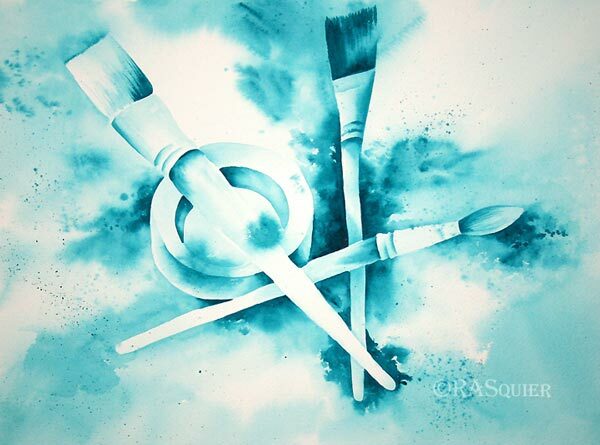 Sometimes to be inspired to paint in watercolor the studio just needs a good cleaning. I sorted through some of the clutter in my studio and put most of it away where it belongs. Scrubbed the art table clean. Cleaned the paint splatter off the lamps, the tv. The curtains, well the paint splatter adds character. The hardwood floor is shiny clean. The drop cloth is in the washer and on its way soon to the dryer. If we don't turn to the left, the studio is ready and waiting for the watercolor painting to begin! For me a clean and organized space is very important. This giant creature was hanging onto the inside of the screen door as I was trying to take the puppy outside this morning. I held the door open and he crawled up to the outside. Then he stopped with one leg still in the door. I propped my flip flop in the screen door so he would not get crushed. I yanked the puppy back into the house, close the main door and ran upstairs for my camera. I had to take a picture of this giant bug, I'd never seen a bug so big and seeing it for the very first time at eye level inches from me was rather startling and word producing. A long slew of words "Holy moly .... phew thank goodness he didn't jump on me!" No potty mouth words. As I took a bunch of pictures, he very slowly crawled up higher. I was able to get my flip flop back and take the puppy for a walk. 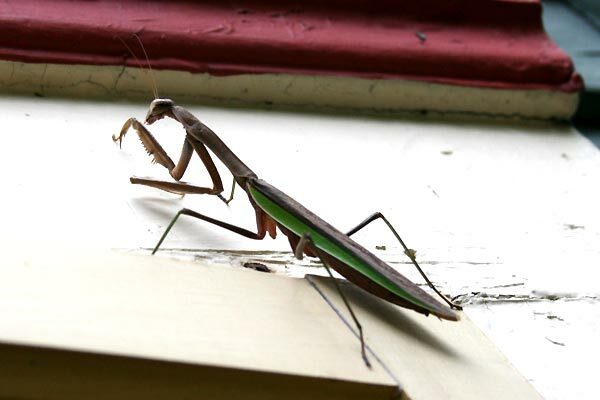 I posted my picture on twitter and almost instantaneously found out I have a praying mantis crawling on the side of my house. Apparently he is good luck. I need all the luck I can get right now! It was suggested I transfer him to my garden. Yeah right! He can find his own way there, I ain't touching it. I did a little research on the internet and got a bit creeped out with the facts and some of the folk lore. I'll ignore the bad stuff like men going blind. I will hold onto the positive. All is good now, I have luck on my side! 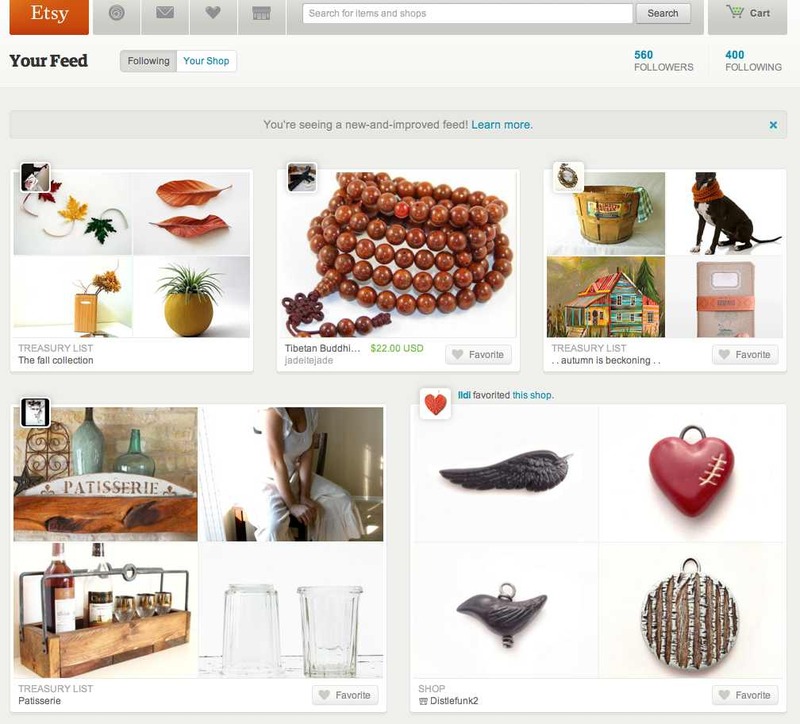 Here's a peek at my Etsy Activity Feed. I love the new layout, the larger photos. Etsy shop owners take amazing photos of their products. The single photos are of items someone I'm following has favorited. The four up photos are either a Treasury I'm in, a Treasury someone in my feed has created or favorited. If you mouse over the the block(s) of photos info pops up next to the mini avatar to let you know more about that block, whether the item was favorited or a treasury was created.